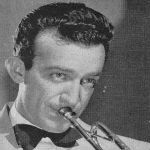 Harry James (March 15, 1916 – July 5, 1983) was an American musician who is best known as a trumpet playing band leader who led a big band from 1939 to 1946. He broke up his band for a short period in 1947 but shortly after he re-organized and was active again with his band from then until his death in 1983. He was especially known among musicians for his astonishing technical proficiency as well as his superior tone, and was extremely influential on up and coming trumpet players from the late 1930s into the 1940s. He was also an actor in a number of motion pictures that usually featured his bands in some way. His was the first “name band” to employ vocalist Frank Sinatra, in 1939, for $75 a week. His later band included drummer Buddy Rich. His featured vocalist was Helen Forrest. Johnny MacAfee was featured on the sax and vocals and Corky Corcoran was a youthful sax prodigy. His orchestra succeeded Glenn Miller’s on a program sponsored by Chesterfield Cigarettes in 1942, when Miller disbanded his orchestra to enter the Army. In 1945, James and his orchestra had a summer replacement program for Danny Kaye’s program on CBS.